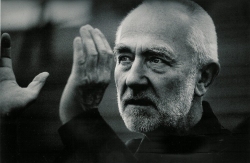 Without exception the feedback from Peter Zumthor's lectures that were held in Sydney on 5 September and in Melbourne on 7 September 2004 has been extremely positive. "Last night's talk was simply fantastic... To find that Zumthor is a man with the modesty, compassion, sense of humour and cultural depth displayed last night was huge bonus!" "The Peter Zumthor lecture was great, really great. He is an inspirational speaker and you guys did very well in bringing him here."